For seafood lovers, scallops are a treasured delicacy. They are tender and delicate, sweet and flavorful, and as an added benefit, simple to prepare. They are not, however, simple to purchase. Like shrimp, fresh scallops can be sold under a bewildering array of names—such as "bay" scallops, "sea" scallops, and "jumbo" scallops—that don't necessarily indicate a specific size or weight. And then there's the mysterious "diver" scallop. But once you understand what each of these descriptions means you will be able to buy fresh scallops without worry. Similar to shrimp, retailers describe scallop sizes by a range of numbers indicating how many of them there are in a pound. Designating scallops as "20/30" means that it would take between 20 and 30 of them to make up a pound. The smaller this number range is, the larger (by weight) the scallops are. You may also see size designations that read "U/10" or "U/15." In these cases, the "U" stands for "under," indicating that it would take fewer than 10 (or 15) scallops to make up a pound. U/10 scallops would be the biggest ones available. These weights, and thus size, are also an indicator of which type of scallop you are buying as bay and sea scallops differ greatly in size. Bay scallops are among the smallest of the scallops, corresponding to 70/120—meaning that there would be between 70 and 120 meats per pound of scallops. (That may seem like a large range but the scallops can be as small as 1/2 inch or as large as 3/4 inch.) Bay scallops are particularly sweet and delicate, but not well-suited for pan searing because they will quickly turn tough; it is better if you saute or deep-fry them, turn them into a gratin, or make them part of a ceviche. Bay scallops are so named because they are harvested from shallow waters of East Coast estuaries and bays. They are less expensive than sea and diver scallops and not considered as much of a luxurious meal. Creating some confusion, bay scallops are also labeled under alternate names. You may see them as Cape scallops, Nantucket scallops, China scallops, calico scallops, and queen scallops. At the opposite end of the size spectrum are sea scallops—the big boys. They range from 10 to 40 per pound or even bigger (U/15 or U/10, for instance). Reaching 1 1/2 to 2 inches in diameter, they can be pan-seared much like a filet mignon, with the high heat producing a crispy outer crust while leaving the center tender and medium to medium-rare. As with bay scallops, sea scallops also are listed under different names. You may find them labeled as king scallops, great scallops, diver scallops, Alaskan scallops, and jumbo scallops. Most scallops are harvested by boats dragging chain nets across the ocean floor. Diver scallops, however, are harvested by divers who collect them by hand. Although the term "diver" does not itself imply a size, the divers generally pick the largest scallops they can find, so diver scallops tend to be in the 10/30 range. Diver scallops are thought to be more ecological because the divers only pick the bigger, more mature scallops; this leaves the younger ones, allowing the population to replenish. Dragging with chains is indiscriminate and sweeps up not only immature scallops but also other shellfish. Just because a scallop has never been frozen is no guarantee that it's been properly handled on its journey from fishing boat to supermarket. But choosing between frozen and fresh will most likely depend on what's available. If you live near the coast and have a reputable seafood purveyor, and plan to use the scallops the same day you buy them, fresh might be best. But a good IQF (individually quick frozen) scallop might be superior to a "fresh" supermarket scallop that's five days old. 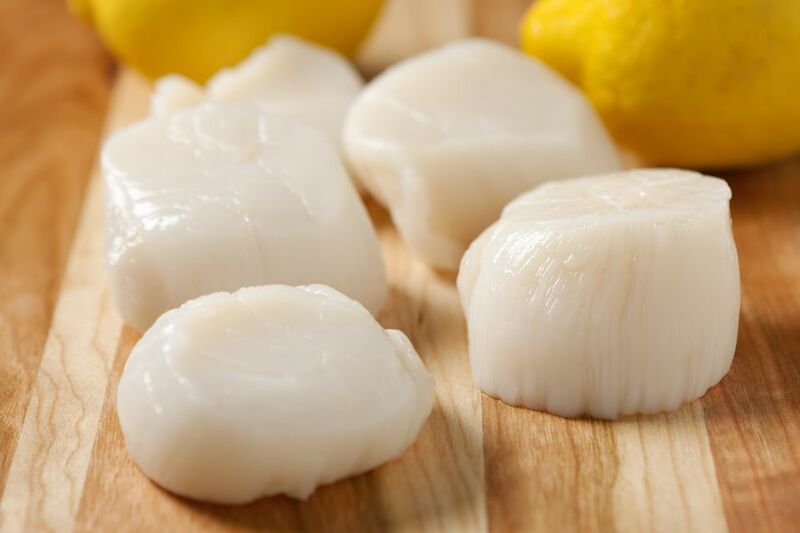 If you have purchased frozen scallops, you should thaw them overnight in the fridge; don't use a microwave and don't thaw them at room temperature. In a pinch, you can defrost frozen scallops by sealing them in a plastic zipper bag and running cold (not warm or hot) water over them. Scallops are often soaked in a phosphate solution that whitens them and makes them absorb more liquid, increasing their weight by as much as 30 percent. So if you buy wet-packed scallops, you're paying $15 to $20 (or more) per pound for water. Also, that phosphate solution is a common ingredient in soaps and detergents, and, not surprisingly, has a distinctly soap-like flavor. When you cook these scallops, all that extra liquid drains out and into the pan, so instead of searing them, you end up steaming them in something closely resembling soapy water. If you want to avoid all that, look for scallops labeled "chemical free" or "dry-packed." Dry packed means that the scallops are simply packed as is, without any liquid or preservatives.